The full-size sedan segment is a modest one, but Nissan has committed the company to it as it introduces an all-new Maxima. Audacious, if not controversial styling marks this five-passenger conveyance, dubbed a “4-door sports car” by the manufacturer. 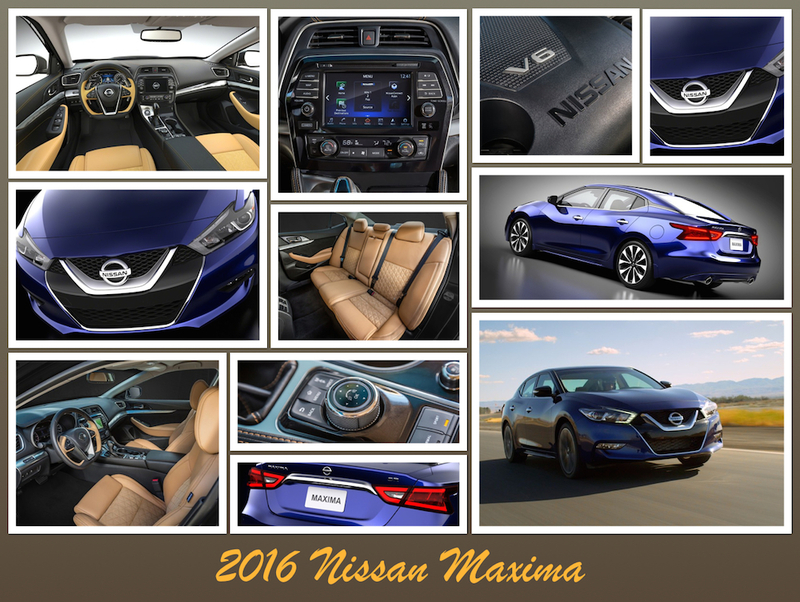 The 2016 Nissan Maxima is now in US showrooms. The Nissan Maxima is a full-size, front-wheel drive sedan and flagship model for this second-largest Japanese brand. On this very day, the 2016 Nissan Maxima goes on sale, a sport sedan that started off as a trim level for the Datsun 810, but later earned its own model designation. In recognition of the Maxima’s persistence, Auto Trends presents to you key facts about the latest model. How far back does the Maxima name go? Well, as a dedicated model you have to go back to 1982 when Nissan models were still known as Datsun in the US. 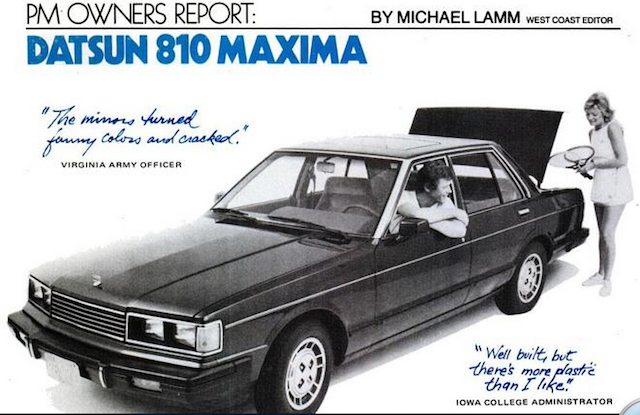 That year, Nissan abandoned the “810” model name for Maxima. But it wasn’t until 1984 when the Datsun to Nissan transition was completed, when the “Nissan Maxima” officially was presented. That year also coincided with the final year of the first-generation Maxima. Edmunds counts nine Maxima generations as it includes the Datsun 810 models sold from 1977 to 1980. Those earlier models were sold in “Deluxe” and “Maxima” trim levels. The most distinguishing feature of the first Maximas was the computer voice that whispered, “Please turn out the lights,” if you forgot to extinguish the headlights. As for Nissan, the 2016 model ushers in the eighth generation. We’ll go with how the manufacturer assigns generations to its flagship sedan. Popular Mechanics surveyed early owners of the Datsun 810 Maxima to gauge their opinions. The 2016 Nissan Maxima almost never happened as reported by Automotive News. Declining sales of full-size cars was one factor that might have led to its cancellation, as well as the cost to produce a new model. Soon after the seventh-generation Maxima came to the market, Nissan seriously considered giving its big sedan the ax. But dumping the Maxima was not to be, as this model still records more than 50,000 units sold annually, a respectable number, but only one-seventh the sales for the midsize Altima. Still, the company recognizes that the Maxima name is significant, with even more brand recognition for it than for the Nissan moniker itself. It is also the longest continuously running Nissan nameplate and a proper stepping point to luxury models, including Nissan’s own Infiniti marque. Nissan says that the Maxima’s design is based on a jet fighter. In fact, the company sent its designers to visit the US Navy’s Blue Angels for concept inspiration. As a result, Nissan claims that the eighth-generation model has been lowered, sculpted and streamlined with a fighter-jet sweep evident in its body. Before the production-ready model was introduced at the 2015 New York International Auto Show, the automaker first showed the Nissan Sport Sedan Concept at the 2014 Detroit auto show. 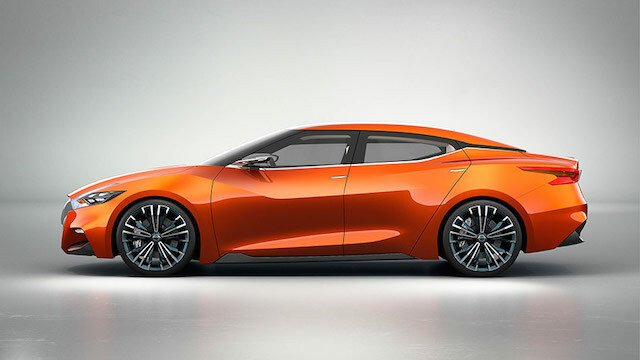 That concept has become the 2016 Nissan Maxima. Nissan relaxed the Maxima’s profile, based on this concept sedan. Other standout exterior features include boomerang-shaped headlights, distinctive LED lamps, wraparound LED tail lights and “4DSC” stamping embossed within the lamps to denote this four-door sports car. The floating roof design, attributed to the canopy of a jet fighter, is also present. Inside, the jet fighter motif is evident in the sweeping and arching lines that traverse the door frames, cut across the dashboard and amplify the center stack. To provide enhanced viewing for the driver, the instrument panel is canted by 7 degrees. And in this example Nissan turned to its own super car, the GT-R, for inspiration. New for 2016 is a display commander, which controls the infotainment system through toggling, side-to-side movements, scrolling and rotating. As for the front seats, Nissan’s “Zero Gravity” design is evident, what provides a natural if not neutral seating position in an endeavor to diminish fatigue and dispense with lower back pressure, and the resultant pain that comes with it. As for the Maxima’s interior, Mike Rabkin, President, From Car to Finish, believes that Nissan has successfully achieved the “premium class above” look it sought for the cabin. 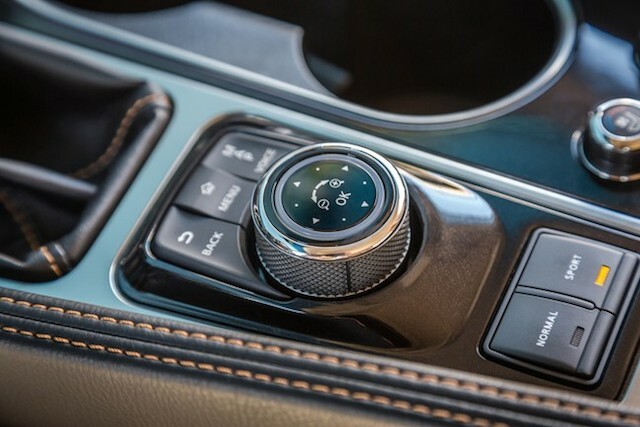 Said Rabkin, “Having Alcantara inserts is a nice touch found in higher end vehicles. And having it “quilted” adds to a more premium feel.” He gave high marks to the seats and to the center stack, and pointed out that the sedan’s telematics has received a much-needed overhaul. There is something inherently magical about performance in any vehicle. And when it comes to full-size sedans, reaching the 300-horsepower threshold is the mark of a potent player. Indeed, the competing full-size Chevrolet Impala is one such success story, with its V-6 engine making a robust 305 horsepower. Both the Nissan and Chevrolet reach their performance levels without resorting to forced induction. And that is a big deal for some buyers. Sure, the previous 290-HP rating was competitive with the 292-HP Chrysler 300 and bested the 268-HP Toyota Avalon, but it still trailed the 293-HP Hyundai Azera. Maxima owners seem fine with the sedan’s Xtronic continuously variable transmission, a proven workhorse that will facilitate the new model in reaching 30 mpg on the highway, for a 30 percent fuel economy improvement over the previous model. Steering column paddle shifters will allow drivers to operate this sedan in manual mode, but those shifters are available on the SR grade only. Drive mode selectors are appearing on more mainstream sedans than ever before. The 2016 Nissan Maxima will offer this in its SL, SR and Platinum grade editions. Two modes — normal and sport — can be chosen. The selector adjusts throttle response, transmission tuning and steering feel. Moreover, it includes active sound management, what pumps artificial engine noise into the cabin. When activated, you will hear a sound that mimics the rumble of the engine. Of course, Nissan isn’t the only manufacturer to provide simulated noise, a trend that isn’t sitting well with enthusiasts who prefer reality over reproduction. Generally speaking, luxury brands routinely offer one or multiple editions with no options available. That strategy is to package the amenities customers want without offering infinite permutations that only make comparing models an annoyance. This is the approach Nissan takes in its Infiniti brand and is also employed with the Maxima. The five grades for the 2016 Nissan Maxima and the corresponding prices are as follows: S ($32,410), SV ($34,390), SL ($36,890), SR ($37,670) and Platinum ($39,860). That’s a big shift from the 2014 model (no 2015 Nissan Maxima was offered), where only S and SV editions were offered. The previous model did offer a pair of package choices — Premium (for luxury and convenience items) and Sport (for performance-oriented amenities). Nissan continues with the stepped up pace whereby the industry is adopting the latest in-cabin technologies to satisfy customer insistence. Here, the Nissan Maxima will satiate consumers by offering standard navigation on an 8-inch color display. 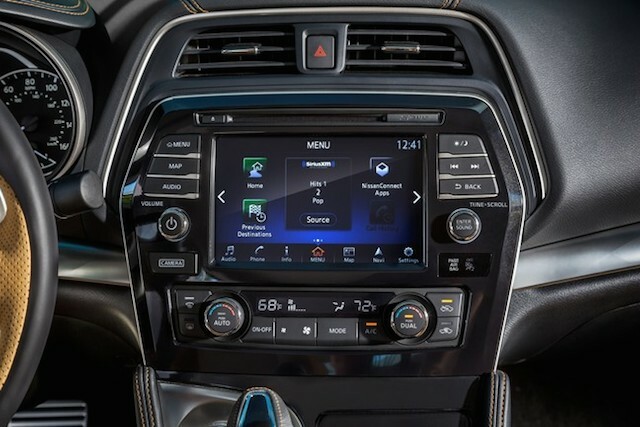 By the same token, it is part of the NissanConnect package that combines navigation, entertainment, and handheld device connectivity in one unit. For 2016, NissanConnect ties in SiriusXM Satellite Radio and SiriusXM Travel Link, online search with Google, and other connectivity features (e.g., Bluetooth, Pandora, iHeartRadio, Twitter and TripAdvisor). Moreover, you can access sport scores, retrieve stock market data, and weather forecasts. A free, 30-day SiriusXM streaming trial is offered. After that, customers must subscribe to a paid plan to continue using the service. Of course, no car built today comes without a standard safety package. Indeed, all Nissan Maximas come with a suite of airbags, front and rear crumple zones, and front seat belts with pretensioners and load limiters. You also get stability control, traction control, and a tire pressure monitoring system. Available safety features include forward collision warning, intelligent cruise control, forward emergency braking, and blind spot warning with rear cross traffic alert. Unique to this segment is an available driver attention alert system (DAA). DAA, standard in the Platinum grade, detects driving behavior by monitoring for various mannerisms that would strongly suggest drowsiness by measuring steering input patterns. To illustrate, when out-of-the-ordinary conduct is recognized — such as consistently encroaching an adjoining lane — the system uses an audible chime sound and activates a coffee cup icon and posts a “Take a Break?” statement on the instrument panel. To that end, Nissan believes that it is doing its part to diminish what AAA says leads to more than 300,000 accidents each year, with 6,400 of them fatal. Without doubt, staying with the Maxima is a tremendous gamble for Nissan as the segment continues to wither. However, the automaker believes that there is yet life in a segment that offers halo possibilities as well as a purposeful segue to the Infiniti brand. And if Nissan buyers do consider Infiniti, the rear-wheel drive Q50’s price point starts just below the Maxima Platinum. Moreover, it comes with a 7-speed automatic transmission with shift control and offers optional all-wheel drive. Here, the automaker may have presented the most compelling reason for Nissan customers to consider Infiniti. Photos and video courtesy of Nissan Motors. Datsun 810 Maxima clip copyright Popular Science.